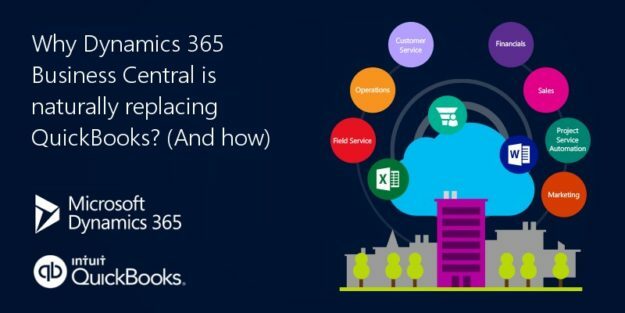 Why Dynamics 365 Business Central is naturally replacing QuickBooks? With the new Dynamics 365 Business Central, Microsoft’s objectives are clear! To allow SMBs to access a world-class ERP platform with 2.7 million users and over 31 years of heritage...now fully on Azure in the cloud! Yes, Dynamics 365 Business central is using the famous Dynamics NAV base to provide the most scalable ERP Solution. Just released on April 2nd 2018, and following the great Dynamics ERP Product family, Dynamics 365 Business Central is an all-in-one business management solution that’s easy to use and adapt. With a familiar Microsoft Office 365 user interface, personalized feeds, and smart notifications, Dynamics 365 Business Central helps SMBs connect their business and make smarter decisions. The easy parameters set-up becomes a liability when you see that it also comes with fewer accounting and auditing controls. After a few years using QuickBooks, many users now switch to Dynamics 365 Business Central because they reached the maximum records limit or need more secure file structure! If any of those reasons sound familiar, don’t hesitate to dive into Dynamics 365 Business Central Features and Capabilities. Also, you take advantage of Resource Center where you can watch Role Based Dynamics 365 Demos (i.e. One for the Owner, One for the Staff Accountant, etc.) and Contact us for more info. Nice to read your blog it was good to read you. This is a great inspiring article…….QuickBooks POS Support is the third party technical support organization providing technical support for QuickBooks Help issues.